Lina’s family has suffered death, hunger, homelessness and been deprived of basic necessities because of Syria’s civil war. They live in Eastern Ghouta, an area that had endured “the longest running siege in modern history”, the UN said in a recent report. In April 2013, pro-government forces encircled what was then a militant-controlled area bordering Damascus, the capital of Syria. Its inhabitants were bombed and denied food and medicine until its capture by President Bashar al-Assad’s Russian-backed forces in April this year. Please donate to Caritas so we can help families like Lina’s. 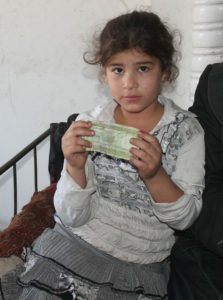 Lina’s family is among Syria’s 6.1 million internally displaced people. The Syrian war, now in its eighth year, is one of the world’s worst ever humanitarian catastrophes. Most international experts estimate over 500,000 people have died in the violence. The United Nations estimates that 13.1 million are dependent on aid inside the country, with 5.6 million in acute need. Lina, her husband Hussein, and their children — two girls and three boys aged from seven to 20 — moved to another part of Ghouta, after they were forced from their home. 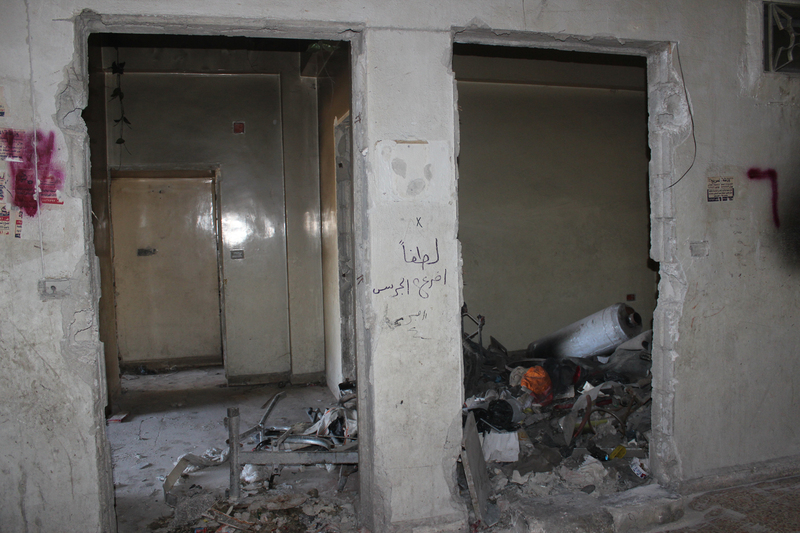 They slept in the street for several days until a local guided them to this disused building, where they set up home. The building that Lina’s family now calls home. 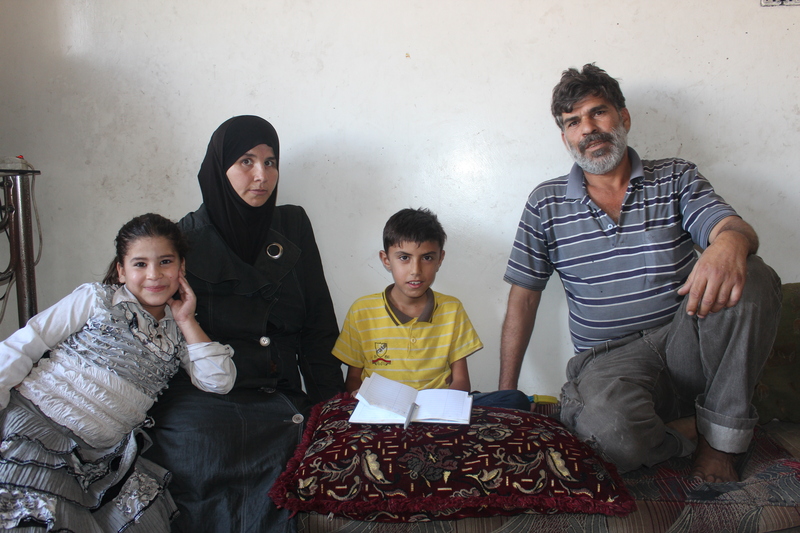 Lina is also raising her husband’s 10-year-old nephew, Abdul-Rahman, whose parents were killed in the war. She treats him like a son, saying that she cares for him more than her own children because he is paralyzed. He can’t move his legs or arms. However, with the siege lifted, there are now grounds for hope. Humanitarian organisations have started entering Ghouta to help the 400,000 families in the area who are in dire need of assistance. In July, Caritas arrived in the area, and cooperating with Hifzalnema Islamic Charity, has distributed 1,480 food baskets, 1,000 packs of fresh vegetables and 600 boxes of diapers. Lina’s family are among those that Caritas has helped. “Although we don’t have electricity and water, we are now living in paradise compared to the past,” said Lina. Lina is pleased that her children now have good clothes. 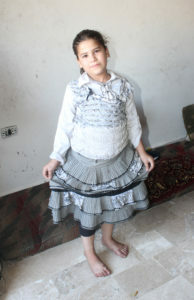 Lina’s spirits have been lifted by seeing her own children wearing proper clothes for the first time in years. “They are wearing shoes now, real shoes,” said Lina. For the moment, they still face great difficulties, including inflation and the coming winter. Inflation is so severe, says Lina, that savings are almost worthless. “My daughter saved a Syrian five-pound note for many years, dreaming that she would use it to buy a biscuit when the war ends,” said Lina. “We discovered that the smallest biscuit now costs more than 50 Syrian pounds”. 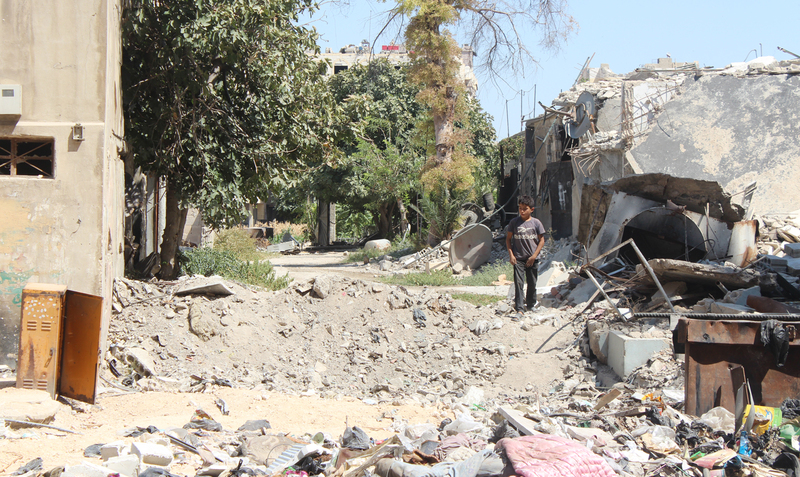 Also, with Ghouta’s infrastructure totally destroyed, a lack of electricity and water is endangering lives. “Now it is coming back soon, we have no means to defend ourselves against it,” she added. And the war is not over. Fears are mounting over a possible government offensive against the rebel-held region of Idlib. The United Nations has warned that an offensive in Idlib could precipitate a humanitarian catastrophe in an area where 3 million people live. Lina fears for her eldest son who recently joined the army on military service and has been sent to Idlib. “I pray night and day for God to protect him,” she said, breaking down in tears. Still, The family is full of hope. They want to return to their home village. Over the last year, Caritas has helped 850,000 people in Syria, spending $87 million on aid. 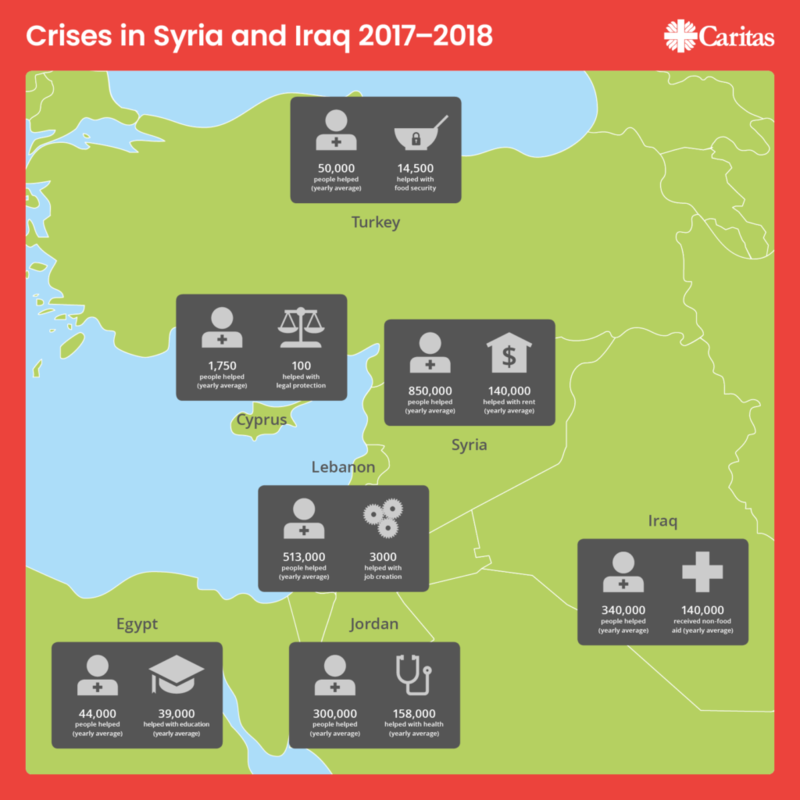 See how Caritas has been helping in Syria, Iraq and neighbouring countries.